Grazing annual pastures in autumn can potentially lead to a significant reduction in pasture seedling density, especially within the first 12 days after the break of season. Grazing in the first 12 days can lower the productivity of pastures during winter because there are fewer plants. We recommend deferring grazing of pasture paddocks at the break-of-season until feed on offer is at least 500–800 kilograms of dry matter per hectare (kg DM/ha). manage grazing pressure during the reproductive ‘flowering’ period in spring to meet seed production and composition objectives. The intent of management in the establishment phase is to allow seedling to develop a root and leaf system that can be grazed without reducing its persistence. Grazing pasture soon after seedling emergence can dramatically reduce establishment because small seedlings get uprooted: this reduces plant density and leaf area, which results in reduced pasture growth for the rest of the season. You can improve plant density and effective pasture establishment by decreasing grazing pressure, applying fertilizer (particularly nitrogen), or sowing pasture seed. An efficient grazing system should aim to maintain FOO between 800-1400kg DM/ha in autumn and winter. Supplementary feeding or deferred grazing can help maximise pasture establishment. Deferred grazing means excluding stock from pasture paddocks after the break of season to maximise germination and establishment of seedlings. there is a late break to the season and cold conditions. After an early break of season (January, February or March) in warmer conditions, it is not usually necessary to defer grazing: it is better to graze this high quality feed to improve the condition of sheep and potentially reduce supplementary feed requirements. These pastures will have adequate time to reach desired production targets before winter. What are the benefits of deferred grazing? Deferred grazing helps establish a dense and productive annual pasture by preventing over-grazing during establishment. It is important to have established a productive pasture before mid-winter, as growth is naturally slowed at this time of the season. A minimum FOO of 1000kg DM/ha is desirable going into winter, but optimum pasture growth occurs at around 1400kg DM/ha. The effects of deferment on plant density will be greater at higher stocking rates. Autumn deferment may be more appropriate for farmers at near-optimal stocking rates. In some seasons where pasture growth is very slow, deferred grazing may be most beneficial when combined with strip grazing because the accumulated pasture is rationed. Refer to the information on strip grazing on the grazing winter pastures page. How do I defer graze? Concentrate sheep on selected 'sacrificial' paddocks or laneways, leaving more productive paddocks ungrazed. Sacrificial paddocks should have low erosion risk. 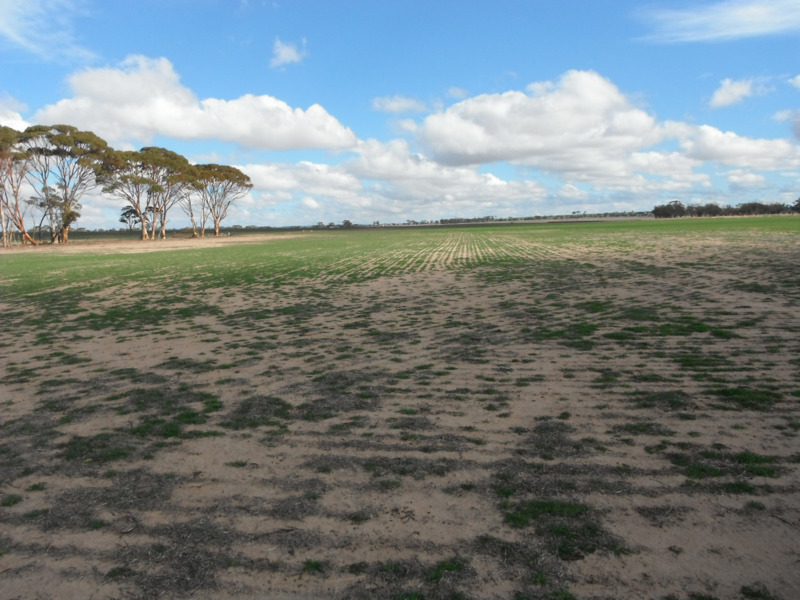 Paddocks entering a cropping phase may benefit from early grazing to remove weeds. Feedlot or confinement feed sheep only if you have the resources to do so effectively. Be aware of the animal health risks associated with this practice. The length of deferment should be governed by pasture growth. Defer to a minimum of 500kg DM/ha (Figure 1), or preferably 800kg DM/ha. Refer to the deferred grazing calculator for details. Run older, dry sheep at higher stocking rates, allowing pregnant or lambing ewes access to deferred paddocks. Be aware that deferred grazing may lead to increased broad-leaf composition in the pasture. Food on offer (FOO) and pasture growth rate (PGR) data is provided by the Western Australian Land Information Authority (Landgate) Satellite Remote Sensing Services. For more background information refer to Pastures from Space. Department of Primary Industries and Regional Development's Geospatial Information Service is providing FOO and PGR maps of this information for the 2018 winter growing season. Landgate has excluded a range of property types including reserves, vacant crown land, forestry and uncleared land as well as any areas covered by cloud. The two maps are updated weekly every Friday following germination of annual pasture. The maps of plant biomass include green annual pasture and green crop canopy when assessing changes over time during the winter growing season in WA. The two maps provide general FOO and PGR information for a locality that can be used in the supplementary feeding calculator for pregnant and lactating ewes and the deferred grazing calculator.